By Dan Horowitz--If Saturday night's "Big Event" was any indication, the future of Toronto's Jewish community is in good, committed, and passionate hands. Those hands belong to UJA's Young Leaders, a group of 25 to 40 year-olds dedicated to making a difference, and to do what they can to engage and educate Jewish Toronto's future leaders. 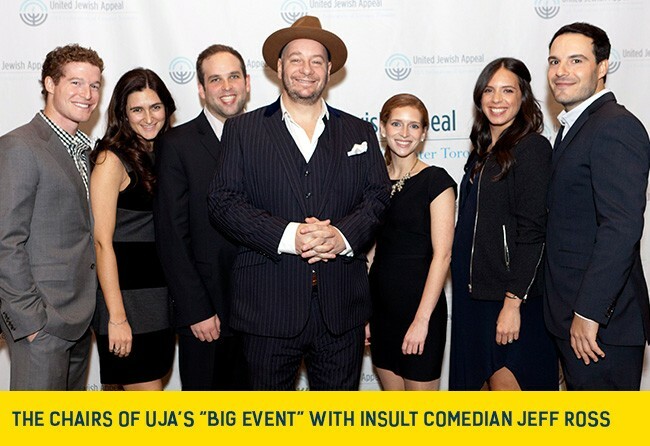 The event, held at the Sheraton Centre Toronto Hotel, filled its Grand Ballroom to the max with more than 600 young Jewish adults who came together to learn about the work done by UJA, and to laugh at the comedy of insult comedian extraordinaire, Jeff Ross. "The Big Event was a wonderful evening that provided us with the opportunity to explain to the 600-plus people in the room the importance of UJA and the work that it does for the Jewish people,” said Tina Erlich, Chair, along with Jamie Davis, of UJA's Young Leaders. "We intend to build on the success of the Big Event by continuing to engage more young people, spread awareness and to ensure the future of the Toronto Jewish community." Featuring an open bar and late night DJ after-party, the evening also included a performance by mentalist, Haim Goldenberg. For photos from “The Big Event”, or to learn about upcoming UJA Young Leaders programs, please visit ujabigevent.com.